October is here and the warm weather is still caressing us with summer temperatures. The city is full of miniskirts and my balcony flowers are blooming incessantly. Still, when the night comes around (pretty early - it's pitching dark at 8 PM!) the Fall takes out its little claws and scratches at the window with chills and winds. So I am slowly making the shift towards a less summery decor in the living room. It's a great time to work my way around the light blue inspiration from the Beachy living room, a few months ago. The star of the season is undoubtedly this traditional rug in Fall colors. I've just bought it a month ago and it already feels like it's been here for a looong time (in a good way!). It works great with the golden tones of the camel leather Marrakesh pouf. Matching the rug, I've gathered a bunch of pillows and a little plaid blanket. After all, we need to be warm and cozy in the evening, don't we? I love the texture mix, with the wool, the fleece, the leather and the sheep skin. 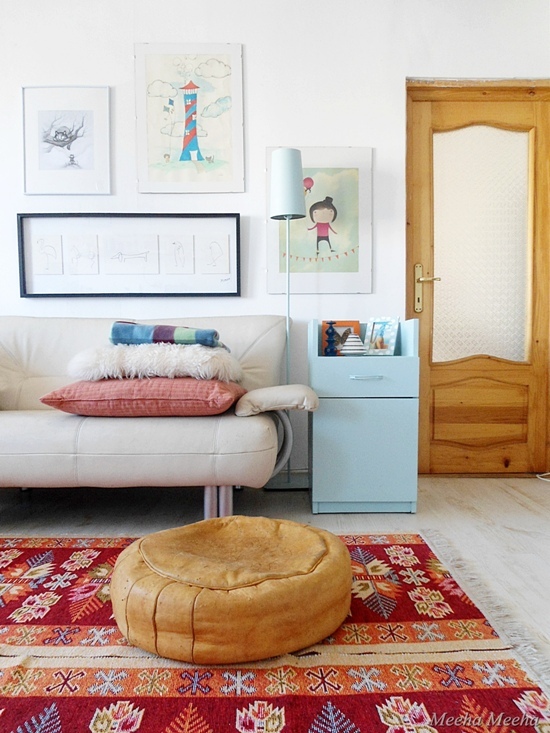 The base of the living room is grounded with burnt orange and warm stuff, while the top side of the room (with its light blue lamp and art) still feels free and summery. Hooray! 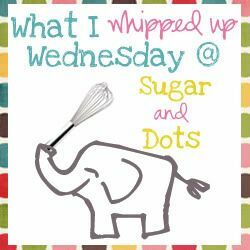 The Fall living room has been featured at Christina's Adventures, Social Salutations, It's Overflowing, Little Inspiration, Sugar And Dots, Under The Table And Dreaming and Sugar Bee Crafts. Thank you so much, it really made my day! What a cozy corner you has create!!! I love it! and the little light blue furniture looks fine! Enjoy the Fall! my favorite season!!! your carpet looks divine! it is handmade, right? i like the way you combine textures and colors. the rug is fantastic! These are the colors I love the most and the pattern too. really gorgeous! Thank you, Laura, I just bought the rug at the end of August. Perfect for fall, right? I love that moment of the year where we put again the carpets on the floor, though it's still early here to do so. Your living room looks lovely! I came here from Shine on Fridays. Thanks for visiting, Tina! It's funny that I do the same as you do: I take out ALL the rugs in May and I put them back on the floors when the Fall chills arrive. It looks just gorgeous - love the blankets ready to be wrapped up in on a chilly night!!! Suzan, I'm so happy that you like the ready-for-Fall living room, thanks for following! 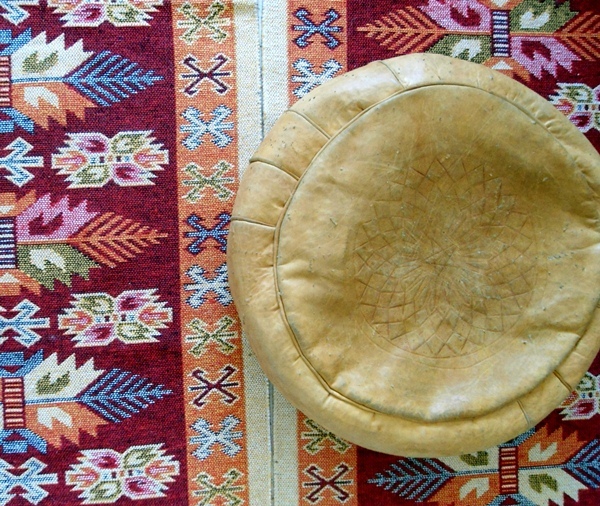 Alison, thank you so much for taking the time to visit - the leather pouf comes from Marrakesh! What a gorgeous space, love the leather pouf, it looks so soft! I just always love your style - and I love this room!!! You did such a gorgeous job!! Fun to see how others transition to Fall. I wasn't even going to bother, but little by little it seems to be happening anyway. I especially enjoyed the plaid blanket and the sheepskin. Nice. The rug is awesome! And I love that leather pouf. So cute! I'm so happy that you like the Fall rug - thanks a million for making time to visit! What a beautiful room! I'm visiting from Not Just a Housewife, I'm off to look around. Love the fall colours Meeha! It looks beautiful - as everything you do always does. Your color combo is beautiful. Good luck on the contest! 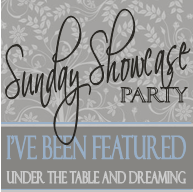 Very pretty~ thanks for linking up at Feathered Nest Friday! Courtney, I'm so happy that you like my little Fall room - thank you so much for visiting! Love your home! That rug is to die for. I featured you this week in my Friday I'm in Love favorites! Aimee, thank you so much for your wonderful gesture, I am overwhelmed - thank you again! What a lovely lovely space! Thanx for joining THT! I'm so happy that you had the time to visit, Pamela, thank you very, very much! Thank you so much for making time to visit, Britni!